Just a few days ago, I had written about a third party embedding tool from Digital Inspiration for embedding Instagram Videos and Photos onto your website, well, Instagram today blogged about the latest update which lets you embed the photos and videos directly from your PC. Fortunately this embedding is as simple as you do the YouTube videos embedding. When you visit the Instagram video or image through you desktop, you will now see a all new SHARE button on the right hand side of the photo/video. You can use this button just like you do with the YouTube videos, grab the embed code, go to the HTML edit of post on your website/blog and paste it. Once you hit publish, the photo/video will appear on your website. This way you can embed your filtered photos and videos anywhere across the web where HTML is supported. 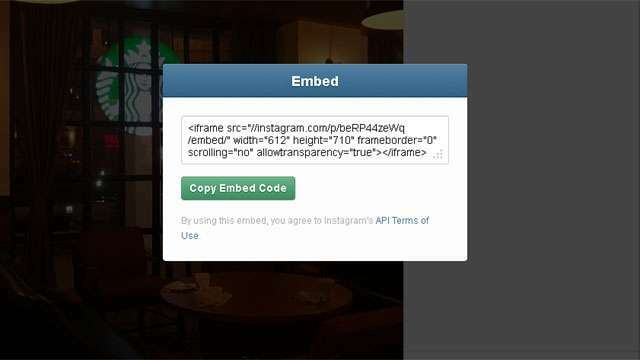 Though Instagram has made embedding possible, it is not yet available from your Instagram App on either Android or iOS. The other thing to note is that you can only generate embed codes for images and videos that are available to the public or the ones that are saved by you. In the case of your saved videos/Photos, once you post them on the website, the privacy settings of the videos/photos you have posted become public(be sure to note this) as will your Instagram page.